I can’t believe it’s Easter already. Good Friday isn’t a public holiday here in Texas, it’s what they call on optional holiday. This means that some things are open and some people have to go to work, but luckily my lovely husband is not one of them. He gets a lie in this morning. 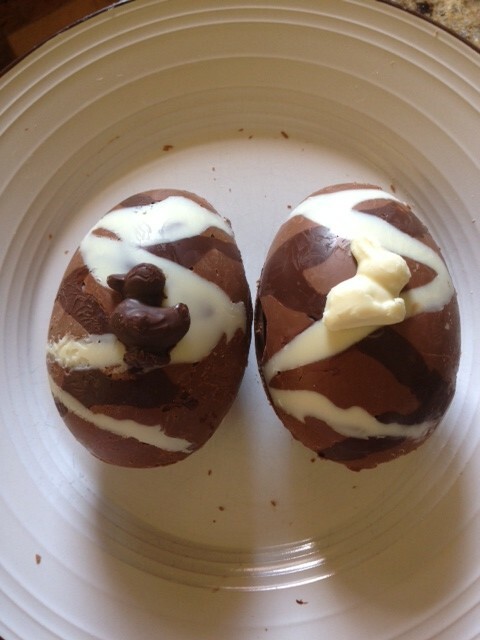 Whilst he has a little extra sleep, the girls and I have been making his Easter Egg. It’s a messy business, particularly when we’re using some lovely Lindt chocolate (there’s been a lot of finger and spoon licking – and that’s just me!) I made eggs for the girls last night once they were in bed. Making anything with chocolate here is a challenge because it’s so warm and humid. It all has to go in the fridge to set but you can’t leave it in there too long or else it loses it’s colour and the nice taste. Then when you take it out of the fridge it goes all melty again and you leave finger prints all over it. Hmm. Anyway, I’m sure they’d be happier with eggs from a shop but the local supermarkets seem to be lacking in nice looking eggs. There are plenty of plastic baskets filled with cheap toys and stuffed bunny rabbits in lurid colours and lots of sweets, but not many nice chocolate eggs. 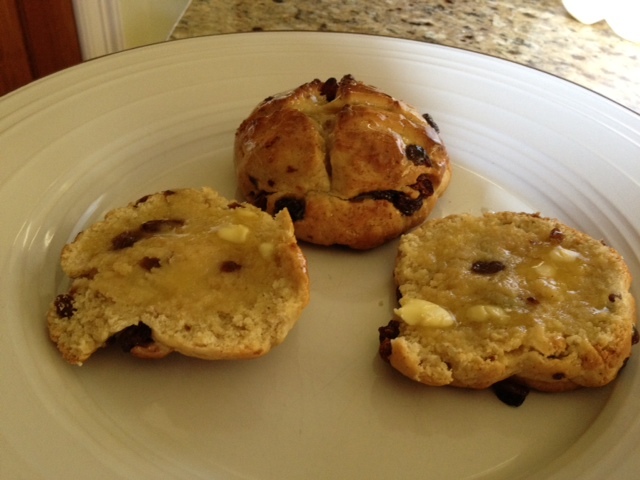 We’ve also had a go at making hot cross buns this morning – without the paste cross on the top as the girls always pick that bit off! They smell delicious and I’m just making the glaze for the top. Hopefully the smell will be enough (along with a coffee) to wake up my lovely husband because it’s a beautiful day and we’ve got things to do. Specifically buying shoes for the Little One who seems to be having a massive growth spurt. She’ll be as tall as the Big One by the end of the Summer if she keeps growing at this rate, and the Big One isn’t going to like that at all.